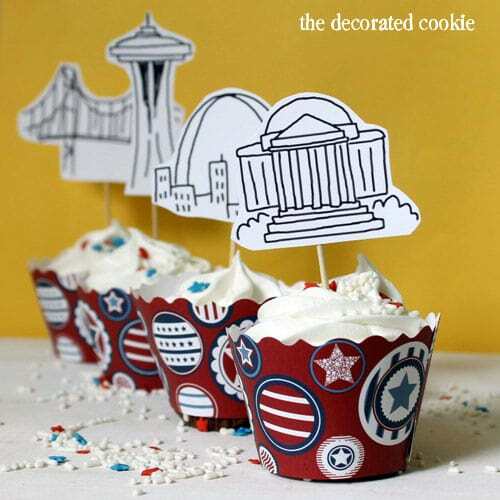 Free American landmarks printable cupcake toppers for these 4th of July cupcakes. 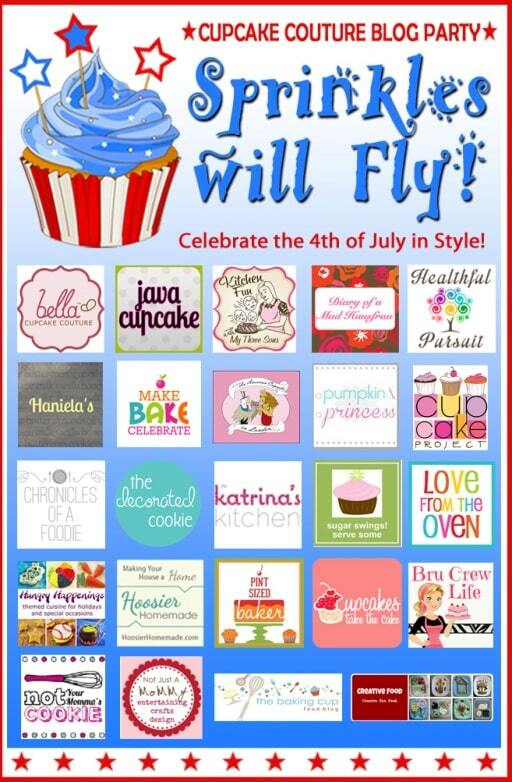 For this 4th of July, I participated in Sprinkles Will Fly, a Patriotic Cupcake event. I and my fellow bloggers crafted festive cupcakes, hosted by JavaCupcake.com. 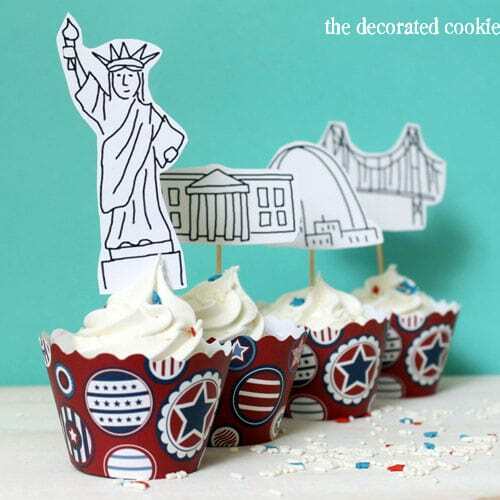 I made American landmark 4th of July cupcakes with a FREE PRINTABLE. To see what everyone made, scroll to the end of this post. These wrappers are so jolly (like that word? I’m going to use it as much as possible from now on) that they need very little to dress them up, so I went minimal. 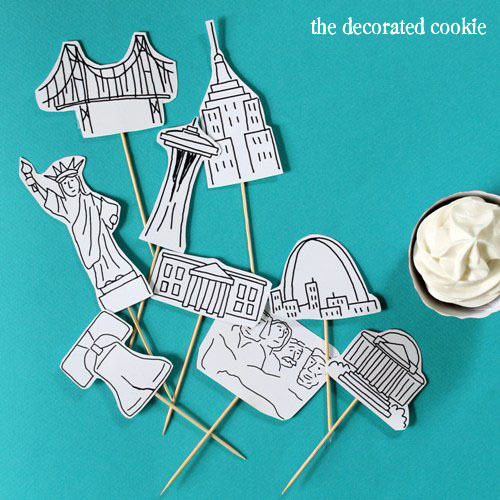 I created a printable that celebrates American landmarks. I left them in black and white, but I’m sure the kiddos would like to help color these in. 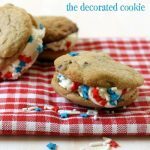 Put cupcakes in the 4th of July wrappers. Print out the printable on white cardstock. Cut around the landmark (I left a few milimeters of white around the black outline). Tape a skewer or lollipop stick to the back. Insert into cupcakes. That’s it! TIP: It would have been cute to use Independence Day washi tape instead of clear tape, but I didn’t think ahead on that one. I love the soft purple and butter yellow ones! 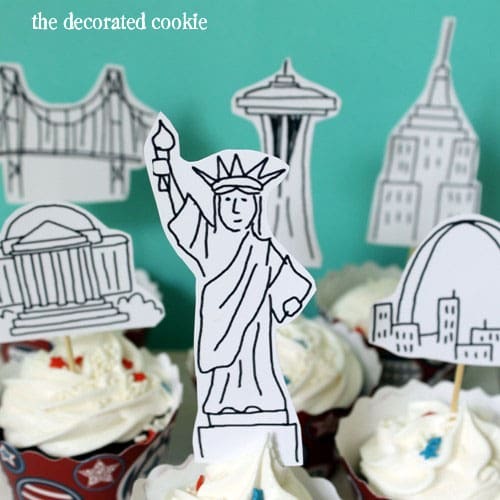 This is such a cute idea and a great way to teach the kids about the different landmarks on their cupcakes! These are the CUTEST… EVER! I like them all! I love 4th of July stuff! 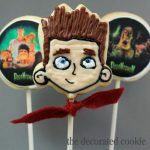 Your drawings are always so fun and made great cupcake toppers. 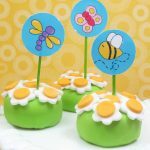 Those cupcake toppers are absolutely adorable! Oh man I love these!! 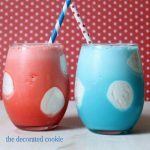 My kids would love these and your right they could decorate too! I love the yellow and purple ones! You are a ninja draw-er. That is all. Adorable. Thank you for the great giveaway! Your cupcake toppers are so fun. I love the Olivia cupcake wrappers! Such cute toppers!! 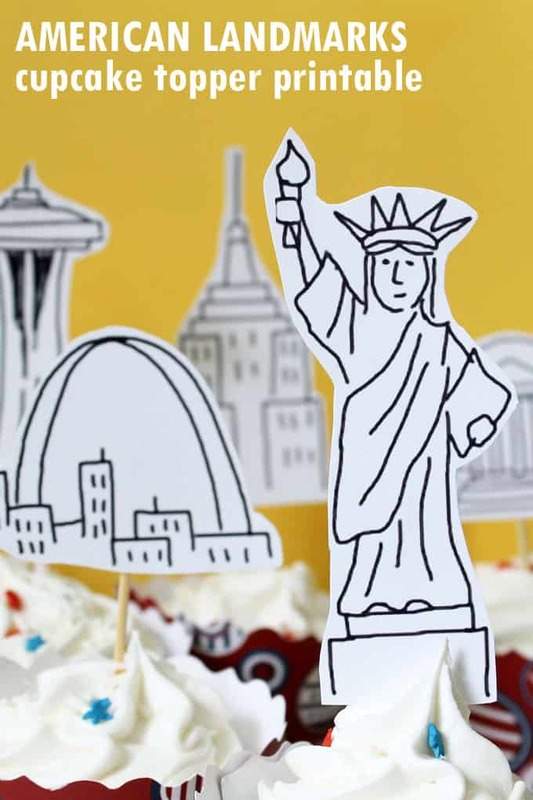 I especially love the Statue of Liberty! 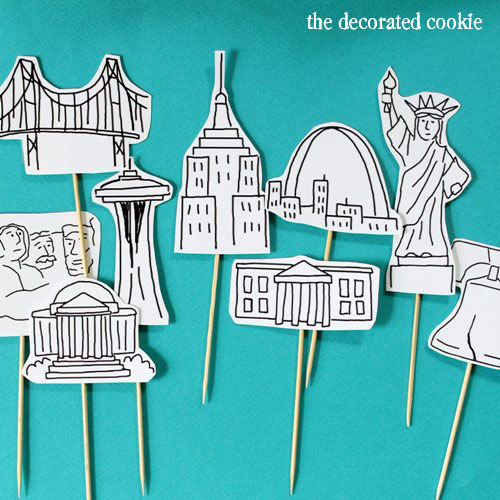 The idea for the cupcake toppers are great. It would be perfect for my nieces and nephews. I love the red white and blue theme. wow! those are great toppers. These are adorable! I love the Statue of Liberty! The silver and white Olivia wrappers are my favorite! I LOVE your toppers! Kids could play a “name the landmark” game. i like the patriotic stars and stripes wrappers! so cute! I love the swirly cupcake wrappers… Subtle and versatile! 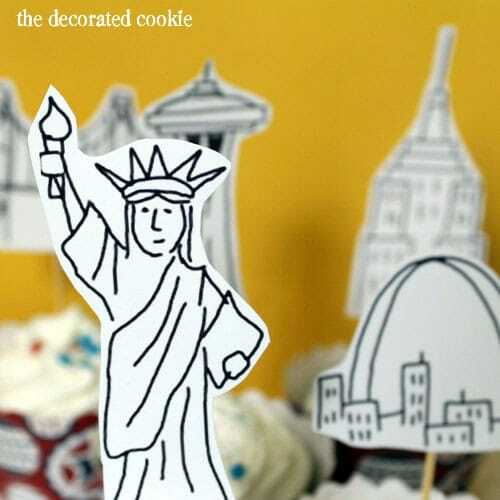 I love your printables, what an original idea for cupcake toppers! I like the navy blue swirl = thank you “4th” a great giveaway! I absolutely love these, they are the perfect finish to my cupcake galore morning adventure. I need to get some of those toppers myself, they are so cool. Thanks for bringing them to my attention Meaghan. I simply LOVE your cupcake toppers! They are so original and look awesome! I love the wrappers features in the post. This is such a great idea. Once could translate it to any country. I LOVE the 4th of July items! I just found your site and I am so excited to make so many of your ideas. I don’t have a site myself, I am just a mom! I like the olivia cupcake wrappers the best. Oh say can you see…..some absolute adorableness!! Wow!! You’ve done it again and made a great display with our cupcake wrappers paired with more cuteness. Thanks for participating.